While studying abroad, our class spent several days at Uluru and spoke with a few Aboriginal elders. They explained to us how sacred climbing Uluru was to them and their culture. This is a sacred site, and I felt it was only respectful not to climb. I totally agree. We did the walk around the Rock, but never climbed as respect to the original owners of the land. 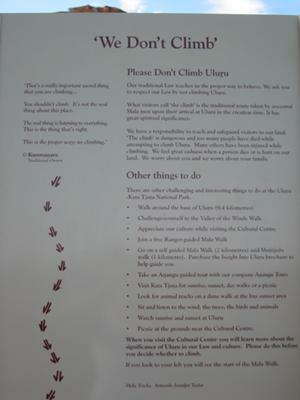 The local people will not 'forbid' anyone climbing - but ask you to respect their culture and beliefs.